I’m scared because the land around me pitches up into the sky. I haven’t seen anything this steep since the Rockies. The road curves around the voluptuous folds of earth. Tomorrow I must cycle. I’m scared because I’m not sure that I will make it. But I need to, have to. I am alone here and there is nobody to pick me up. If I can’t cycle up French Mountain then I will walk it. This is what I wrote the night I camped at Corney Brook, a basic campground nestled between the gulf of the St Lawrence and the looming French Mountain. 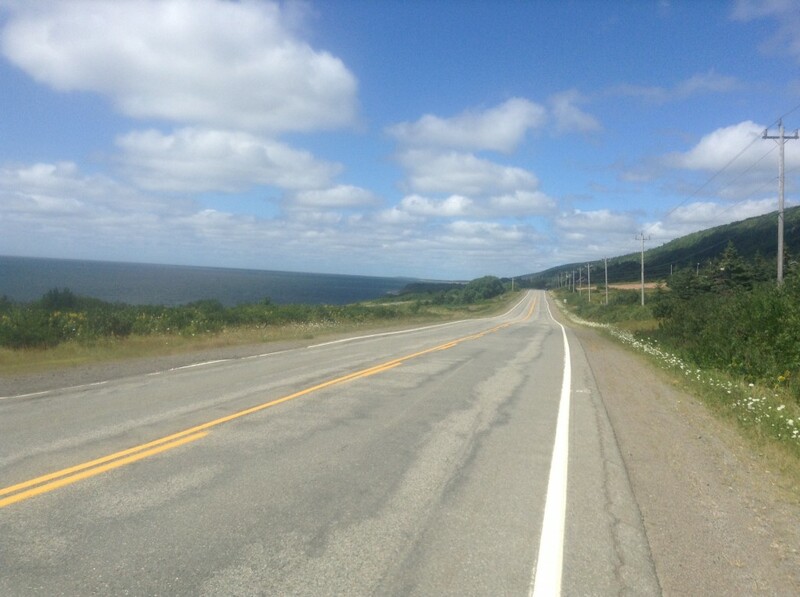 It was supposed to be a rest day but I decided that, rather than fret all day on Cheticamp Island about the looming ride ahead, I would shuffle forward 26km to make the ride along the Cabot Trail less epic. I still managed to fit in some of the fixtures of a rest day. I did my laundry in the worst manner possible. I realised once I had trekked all the way over to the laundrette that I had forgot my camp soap. Oh well, I guess this normal soap will do, I thought, breaking off a few lumps with my fingers and smearing them on my tshirt. It was only when the clothes were hanging on my self-made washing line that I noticed the lumps of normal soap were exactly where I had smeared them. The tissue I had left in my short pocket was now in tiny flecks of white scattered over everything. If I’d had time I would have washed it again. But I didn’t. And since it actually smelt nice and clean, the soap smears and tissue fluff remain. Another fixture of a good rest day is to have a good campfire and a beer. The problem with that was that the basic campground I was shuffling to did not sell firewood. I had purchased firewood on Cheticamp island but, as per usual, not burnt half of it. It seemed a waste to leave it behind so i set about strapping in together with an ingenious set of knots and affixing it onto Monty. It weighed an absolute ton but I was quite chuffed with myself. On route to the campground I passed through Cheticamp village and picked up a beer which I would late leave to chill hidden under a rock in the brook. I was all set for a lovely afternoon. Blimey the hills. No sooner had I rounded the corner out of the village, over the rocky river and into the national park when the contours started to riot like the noise visualisation on a booming stereo system. 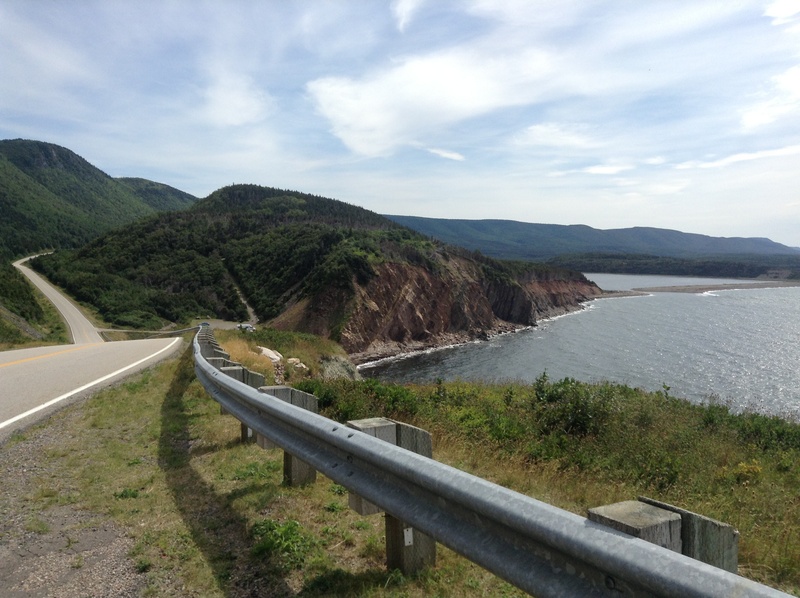 It’s not called the Cape Breton Highlands for nothing. The road swept and twisted like a rollercoaster over the hills and plonked me down at the campground at the very bottom of French Mountain. After a small afternoon snooze and exploration of the pebbled shore, I opened my beer and began cooking my beans and spider dogs on the campfire. I noticed a family had arrived and was setting up their gigantic tent in the pitch next door. The daughter was looking for firewood but finding none. I had just finished my last spider dog when the the Mom and daughter came over. Second Dinner!? Yes, please. I wandered over and was given a healthy portion of spaghetti with fresh mussels and shrimps. “I’ve never eaten mussels before,” I commented. And Dad gave me a quick tutorial in how to eat them. It turned out that it was the daughter’s thirteenth birthday. So she had got to pick what they had for dinner. They wanted to have a fire but didn’t have enough wood. I invited them over to “mine” for a campfire dessert and rushed home to tidy up my fireplace so that there was a clean space for them to sit. Thankfully I had ample ingredients for s’mores so I was very pleased to be able to share them with the birthday girl. She didn’t get a cake but she did get to toast some s’mores. And a few marshmallows caught fire so she had blow them out like a candle. What a great birthday. 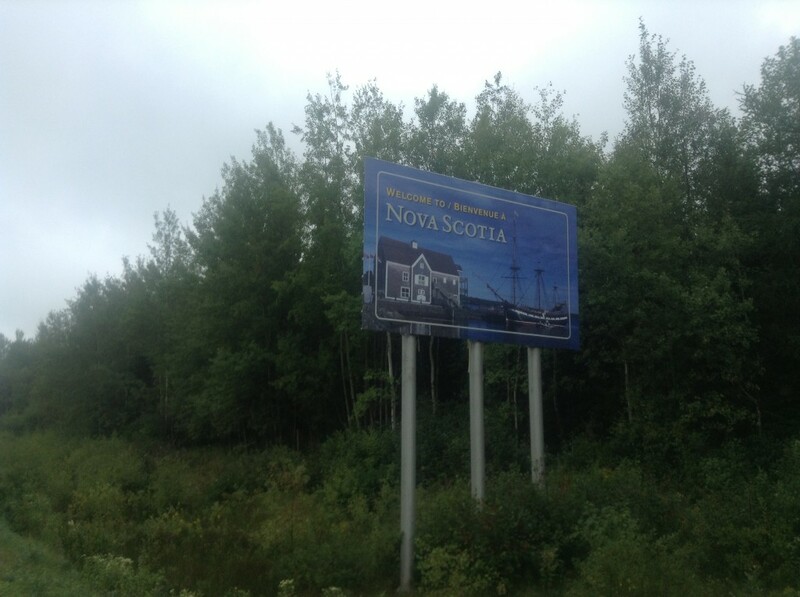 Welcome to Nova Scotia! Well, yes, it is quiet Scottish isn’t it? Because its raining again. And there is a sign post for New Glasgow. 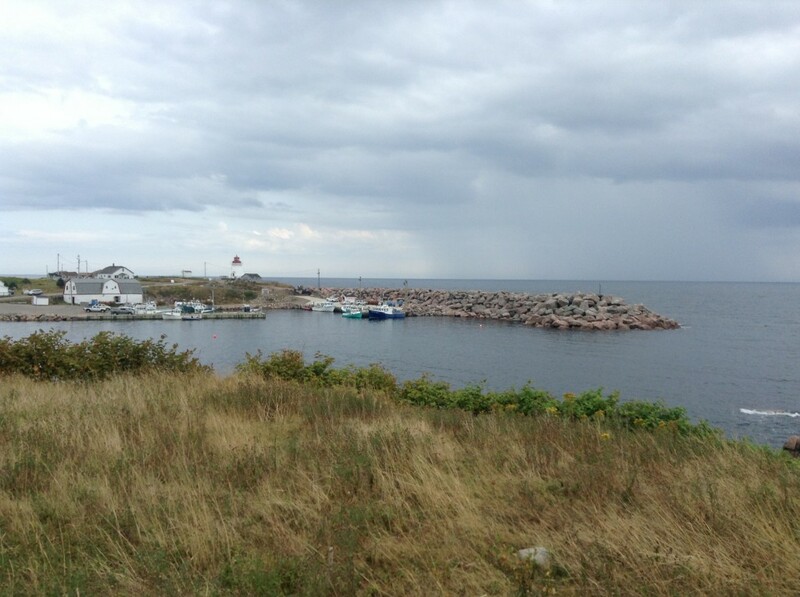 It had started to rain as the ferry from PEI as we approached the misty coast. Just after the ferry port, I stopped for a quick cup of tea hoping the rain would abate. It didn’t, it just rained harder. It poured. A man walking outside with a cardboard tray of coffee saw me and commented cheerfully “at least my bike fits on the back of this!” Nodding at his SUV. Oh, because that’s a helpful and encouraging comment. I did not respond. Monty and I splashed off down the main highway. Monty’s tyres made a slick hiss as they wove through the pooling rain. We approached an intersection. And there it was: HALIFAX. The first sign of the end. 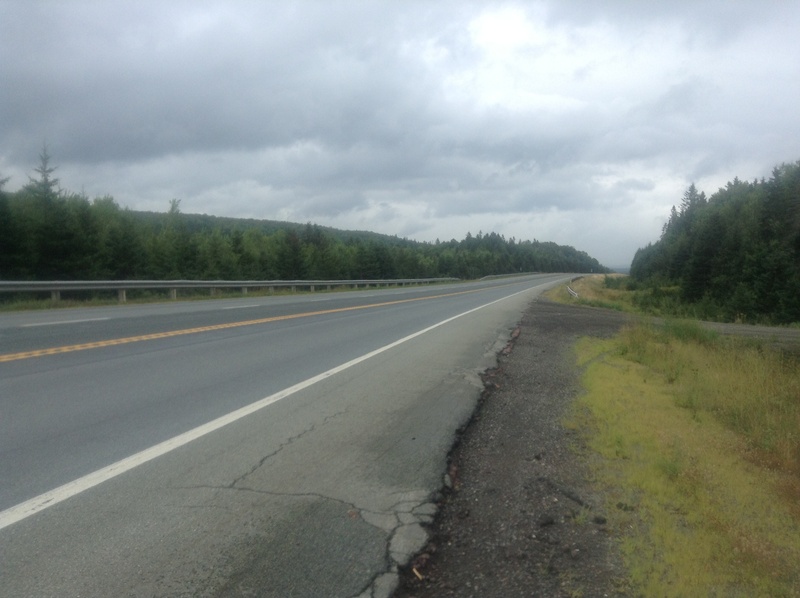 I could get to Halifax in 2 days, just turn West and pedal. i laughed to myself as i cycled past the turn to Halifax. I want to prolong the fun. I am headed East. All day I was in a ridiculously cheerful mood. My joy was unrelentingly upbeat despite the pouring rain. I only have 9 days left of cycling but I am determined to enjoy them. I could barely see anything in the grey fog of rain. Cars zoomed past. The rain seeped through my jacket. My socks squelched. Eventually the rain abated although it made precious little difference given that my socks were saturated and the road was still covered. Each passing truck sprayed the pooled rainwater sideways into me and Monty. But the lifted clouds had improved the visibility. I could now see the next hill approaching, the neighbouring mounds piled with trees. The verge was decorated with white flowers and tangled grasses. There wasn’t a lot else to see. No towns, no roadside stops. Just hills. Blimey, lots of hills. 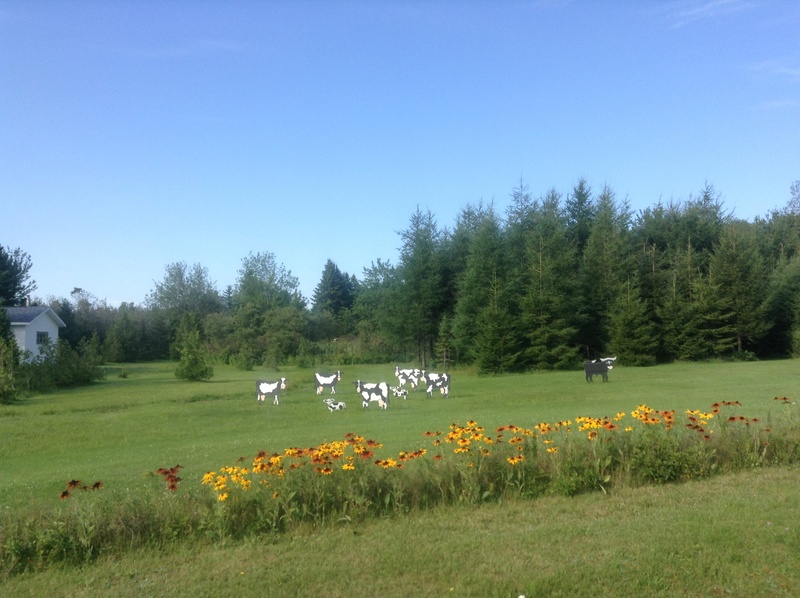 I saw a sign welcoming me to Antigonish county. It was in English. 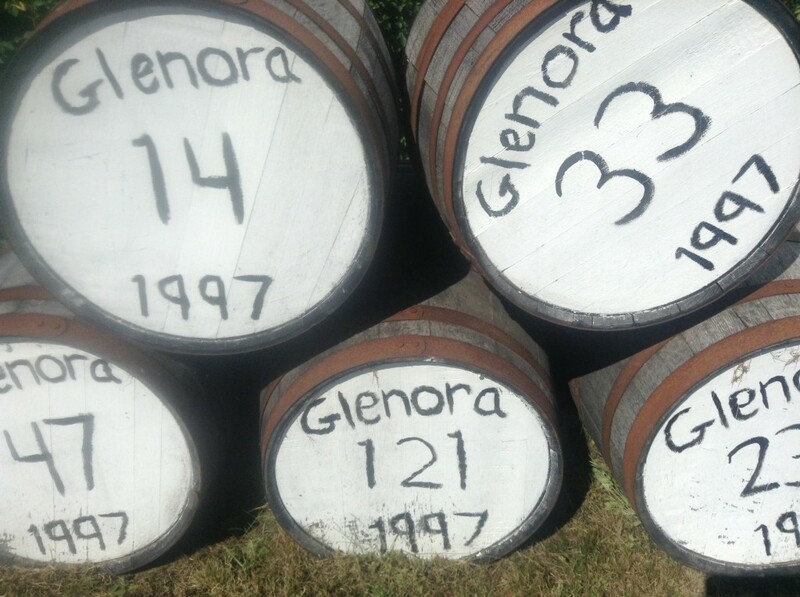 But the second line underneath was written in a second language… Gaelic. Given how drenched through I was I decided to treat myself to a motel. The motel owner, a former police officer, was very friendly and equalled inquisitive as he interviewed me about my trip. He couldn’t quite believe I biked here from Victoria, BC. (Neither can I, to be honest, it is such a long way). We chatted for a while before I turned to go to my room. He’d had a woman here before demand to leave when the squadron of police cars had ferried round in the darkening night. Suspecting the police to be cracking down on the drug den located in the motel she was indignant that she wasn’t going to stay at a place of such lowly repute. While my socks hung over the shower rail, I ended the day lying on my huge, comfy bed eating take away pizza. It was worth the $3 extra to have it delivered. I will sleep well. Tomorrow I head to Cape Breton. 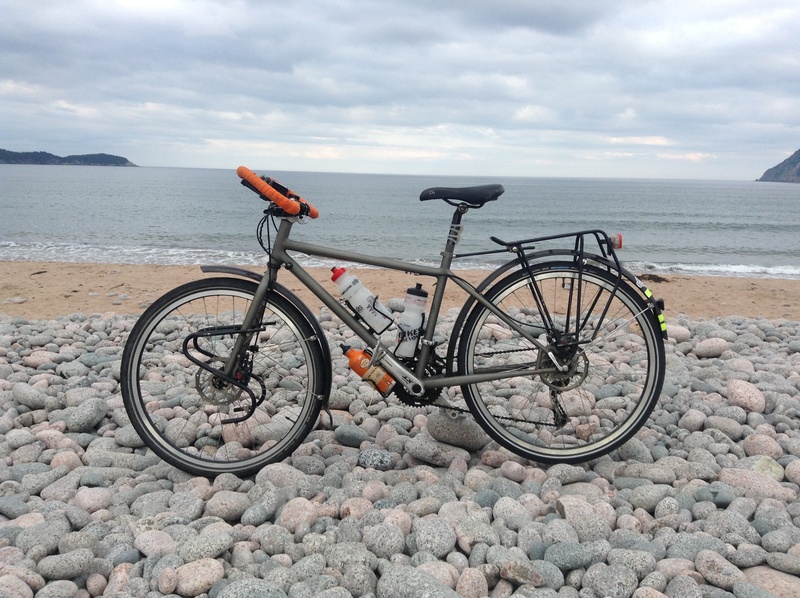 It may be amusing for English folk to know that today I cycled from Cumberland to Northumberland via Cornwall. I woke up early enough to see the sunrise. The days are getting so much shorter now that orange slice of sun was only sliding through the far line of trees while I brewed my morning coffee. I set off at 8am along quiet roads. The early morning light tinted the agricultural landscape as if I were looking at the golden fields and rows of green potatoes through a glass jar of runny honey. The air was soft and hazy. 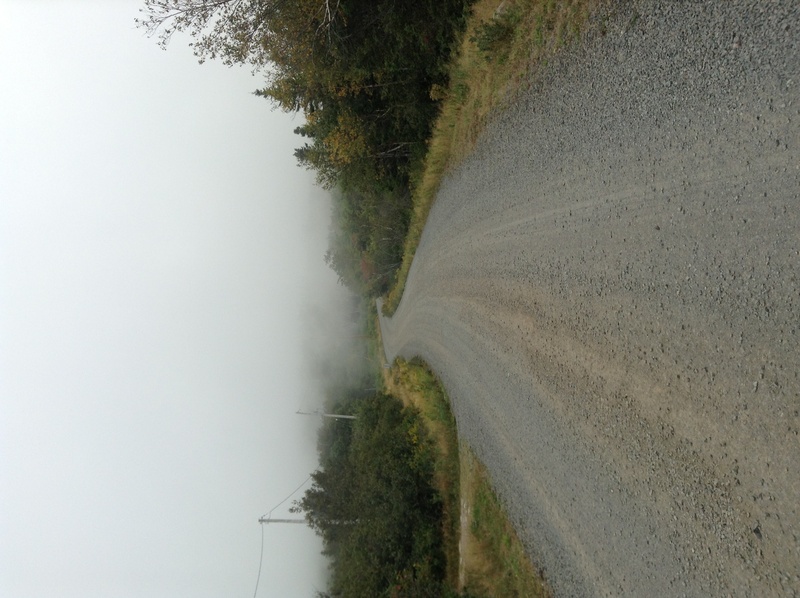 It was also unexpectedly hilly. My legs are strong now, I can tell, as I tapped out another climb. Cresting over a hill would afford me views of the island, disappearing in bands of fading blue on the horizon in front. Wooden houses stood on farm fields and cows munched languidly in the fields. The soil here is as red as the coast. Farm trucks spray out a film of this rusty dust as they bump along the tracks back to the barn. When I reached the town of Cornwall I knew it wasn’t much farther to Charlottetown. I had a number of jobs to do in Charlottetown as I had got into my head that this provincial capital would be the last busting metropolis I would meet until Halifax. First I had to swing by a bike to shop to get Monty a new tyre. Although they had the right tyre in stock (a Schwalbe Marathon Plus) they also gained the prize for being the first bike shop in Canada to charge me for labour. For putting my tyre on? Pah! I would have done it myself. I thought they were just being friendly. Oh well, job done and Monty is now happy. Today I spent a ridiculous amount of money on protein bars. 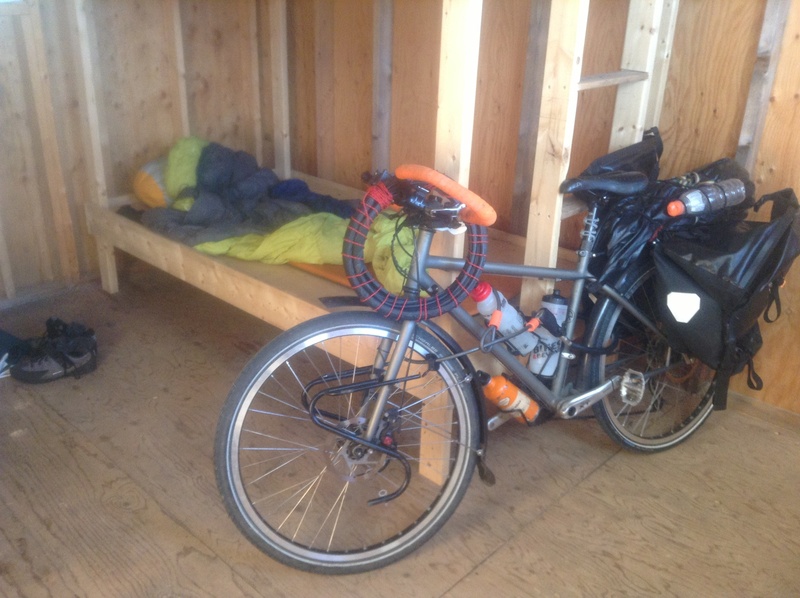 For those that think that cycling is “free” compared to the old motorcar please note: I spend more on protein bars per week cycling across Canada than I used to spend on gas (translation: petrol) per week at home. I now have enough protein bars that I can munch two a day for the rest of my trip. I nipped to the grocery store to stock up on crackers, avocado and Kraft dinner. 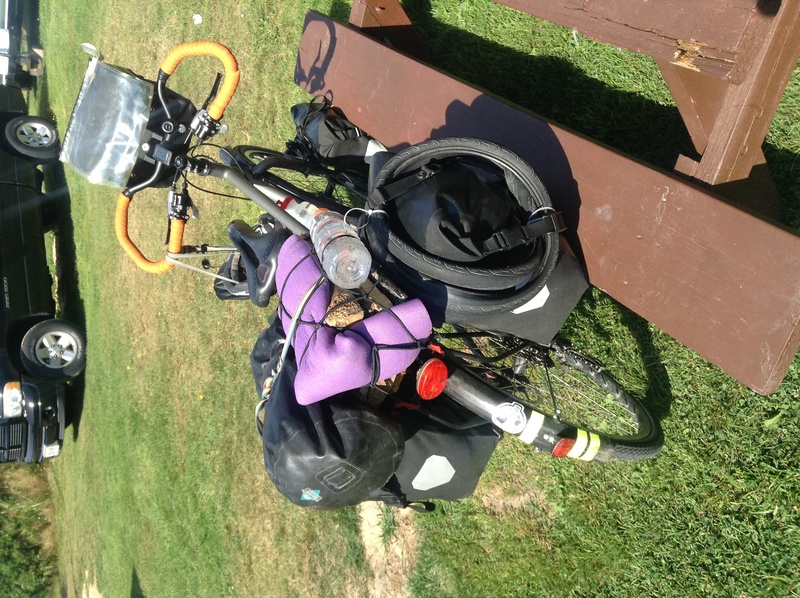 My panniers now weighs a ton. Jobs done, I headed to downtown Charlottetown. There were lots of tourists bimbling around the waterfront. I guess I am a tourist too as I sat in the shade by the wharf eating lobster roll and another icecream. I met a very bearded man with small round spectacles propped on the end of his nose and a yellow cycling jersey pulled snuggly over his round belly. He was from Montreal and was visiting his holiday home on Ile de la Madeleine. Everyone who has mentioned this island has enthuse with how beautiful it is. Floating north in the gulf of the St Lawrence it is closer to PEI than its home province, Quebec. It’s so far out the way that I cannot cycled there this time but it does give me an excuse to come back and explore more another time. It was hilly this afternoon. I was not expecting such big hills. Up, down, and up again in 28 degree heat all afternoon was hard work and had me reaching for the emergency Skittles. 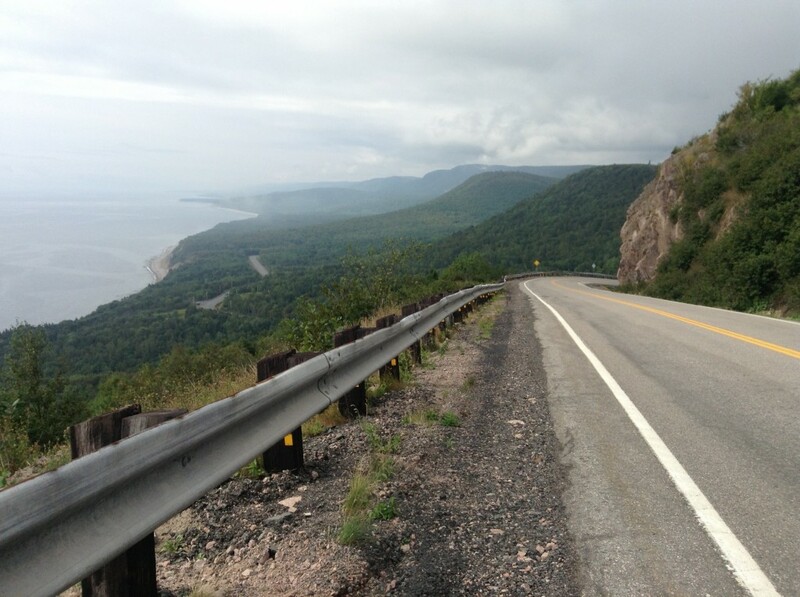 I am beginning to worry a tad about the Cabot trail. I have been warned of “3 mountains” which are 15%. 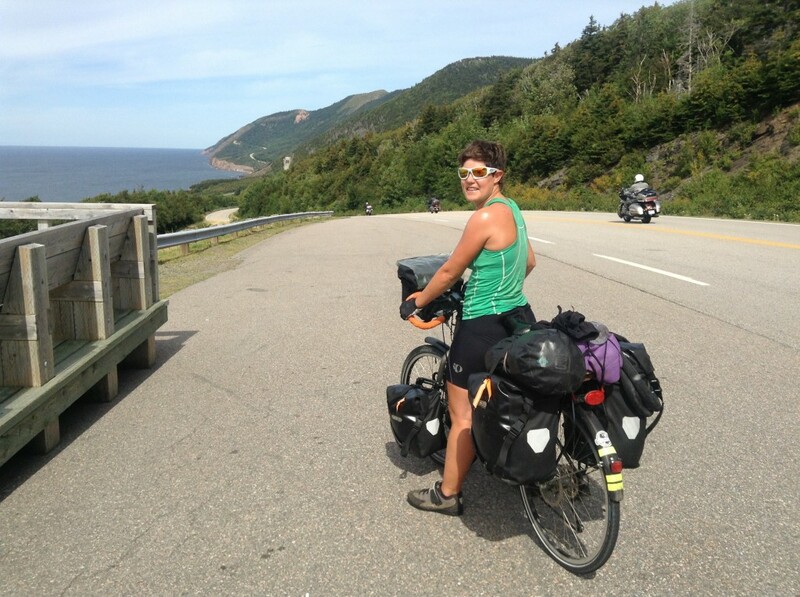 And over a cup of tea, friends of Aaron and Shelley told me that the Cabot trail was the hardest cycling in Canada. I believe them because these two cycled across Canada in 2008. That was how they met… and they are now married. Just before I reached my campground I saw a liquor store so nipped in to get a local brew. 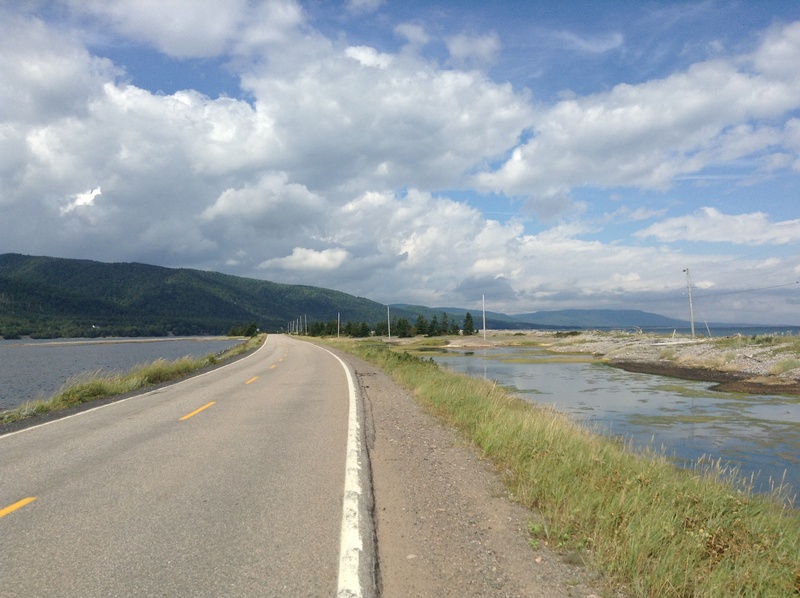 David, another trans-Canada cyclist who is a few days ahead of me, had tweeted me to recommend this spot. And it is gorgeous. There is a red sandy shore dotted with slimey apple green rocks. A couple play in the rolling waves. A lone gull is flapping its way home. A boat’s horn sounds in the distance. You look out to the horizon. First you see a lighthouse blinking from the rocks and then a faint smudge of land. I pitched my tent by the sea front and pondered what to do next: drink the beer or go for a swim in the sea? Tough decision. The breakers crashed into my knee caps, splashing the cool, salty water up my sweaty, suncream sticky body. The sea was refreshing. I thought of childhood holidays in Cornwall. I had a body board and I used to paddle out into the salty waves of the Atlantic on it and ride back in under a hot blue sky. 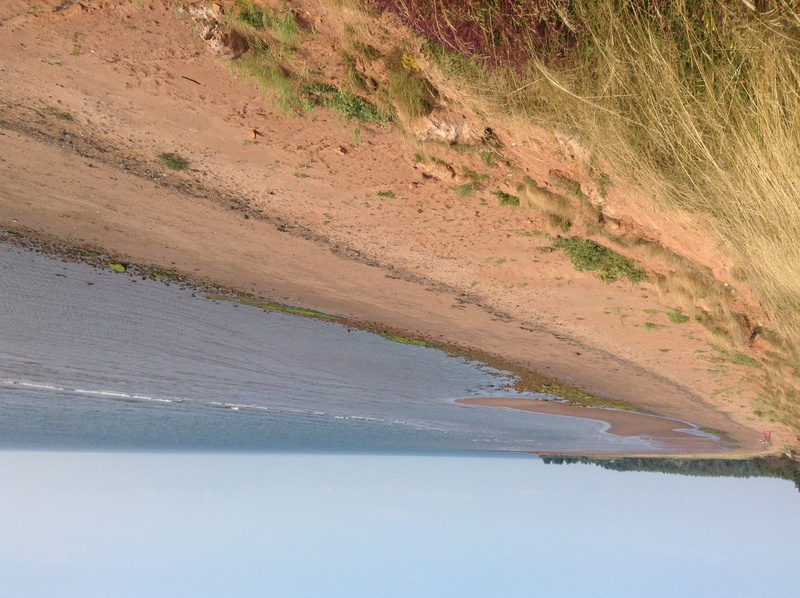 This water here is part of Northumberland Strait and looks over to the mainland and Nova Scotia. It is almost the Atlantic. It is almost far enough. Tomorrow I will take the ferry over to my last and final province. The pull of the sea is great. Soon enough I will be by the sea again but this time, if the world could only be squashed flat, then it would be England I could see on the far shore. And Rock, Padstow and the sandy beaches of the original Cornwall. Home is soon to be in sight. 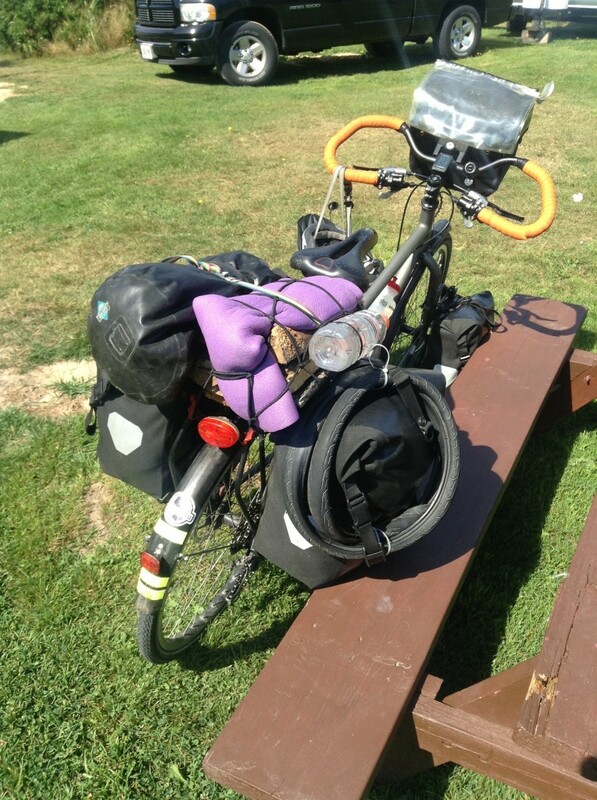 I was packed off in the morning from Aaron and Shelley’s with a full belly, a lunchbox full of the blueberries that I picked yesterday, and other provisions for the journey – including a small bagful of homegrown beans! I added significantly to the beans’ food mile by carrying them with me for 137.5km before they pimped up my noodle dinner. The noodles, ridiculously, I’ve been carrying for 4,000km. I had an easy and enjoyable start to the day cycling along the river. 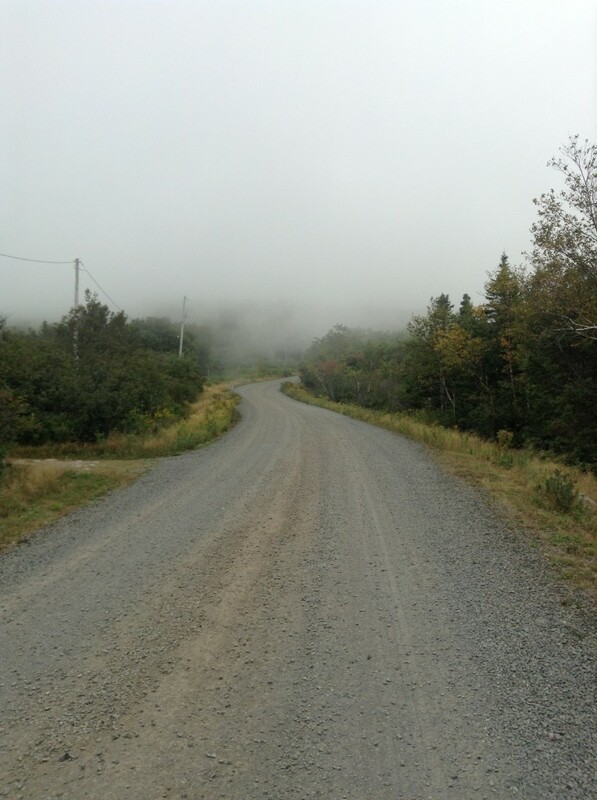 I pedalled past sloping farmland, wooden houses decorated with Acadian flags, old worn looking pick up in the driveway and the occasional bored teenager on a bike. After less than an hour on the road I couldn’t resists nipping into Tim Hortons. On the one hand, for the entire trip I have been promising myself that one day I would buy a whole box of donuts. On the other hand, staying with Aaron and Shelley reminded me how homegrown vegetables are unparalleled in their tastiness. Oh dear. 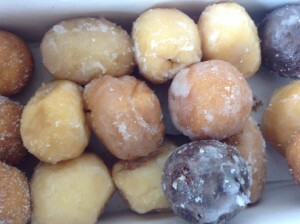 I ended up buying a whole box of Timbits (translation: donut holes). The box of 20 Timbits did not, I’m afraid to say, last til lunch. 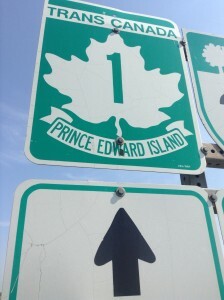 After 50km I stopped in Shediac where the remaining Timbits were devoured along with juicy, handfuls of blueberries bleeding purple juice over my fingers. I am glad the washroom has a mirror as I had blueberry juice all round my face. After lunch I pedalled again, and continued to pedal, and kept on pedalling. I did that thing that if someone else does is really annoying: “Oh, just a few more km.” Then, “oh just a few more” and “let’s just reach the top of this hill” etc. 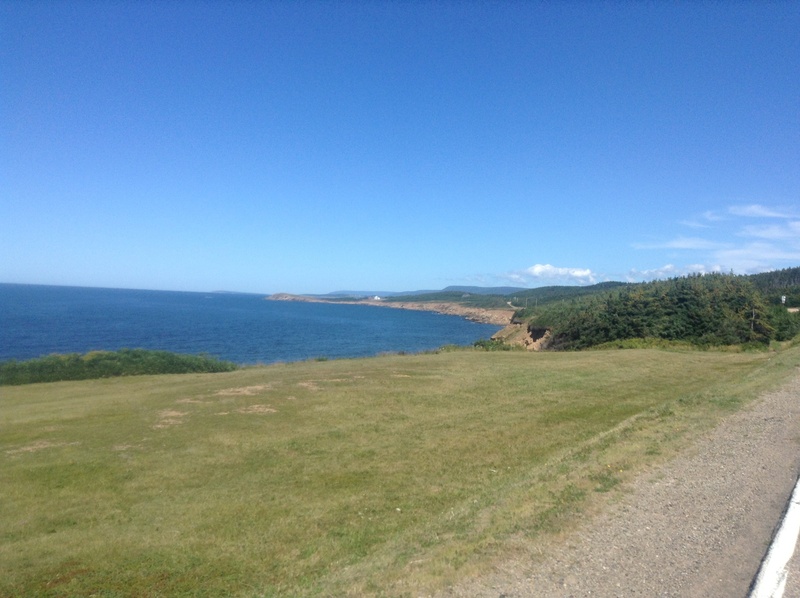 I managed to churn out 108k, before I stopped for lunch at a pretty spot overlooking the Northumberland Strait, the stretch of land that separated Prince Edwards Island (known to all as PEI) and mainland Canada. When the smudge of indigo on the horizon sharpened into view my legs found the energy to push faster. It’s confederation bridge! 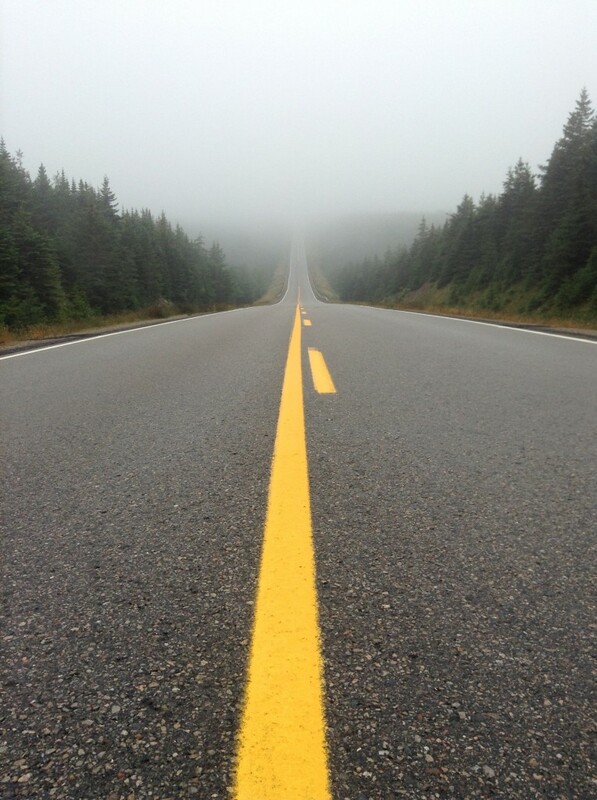 The road to a new land! The crossing to my penultimate province! Monty and I had to catch a shuttle bus as it is illegal to walk or cycle across the 13km bridge. Blimey, I was glad for there was only a small barrier protecting the two lanes of traffic from the fall into the drink. The snaking bridge curved over the blue waters. 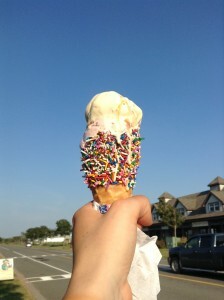 Shelley had tipped me off that PEI is famous for its icecream. “It’s tourist prices,” the driver had huffed when I asked for directions. 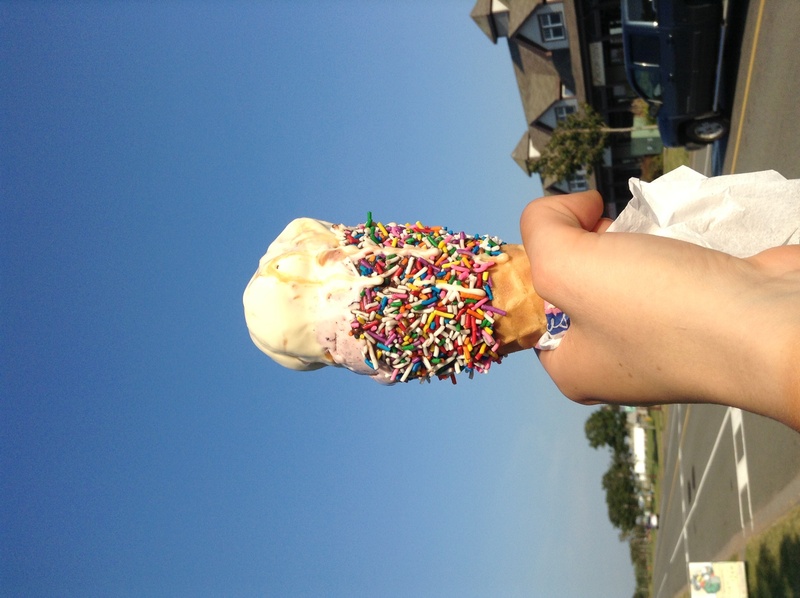 But thankfully the BIDIB (beer, icecream, delicious item budget – $400 that I saved by not going to Newfoundland) afforded me a double scoop of cowberry and salted caramel in a sprinkle coated waffle come. Nom nom nom. The last icecream-fuelled kilometres to the campground were the best of the day. The cornfields shimmered in the lowering late summer sun. I turned my head to catch vanishing views of the bridge standing like a blue snake on stilts over the water. The cornfields were bending over in the wind. The windy sky was a spotless blue save for a few contrails. A flock of starlings swirled over the fields. 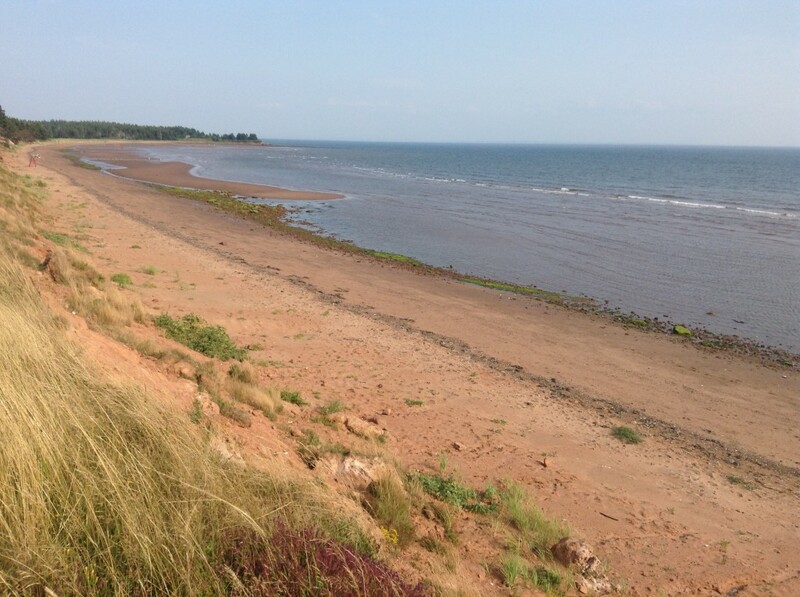 My campground overlooks Northumberland strait. The sun has set behind the line of spruce trees. The surf nibbles at the shore. The strong wind buffets my tent. I am sitting under the flap of my tent when I notice the moon rising. It is pink. The large disc appears on the eastern horizon like a second sun that has been wrapped in a rich salmon coloured silk. It is moments like this, in awe of the quiet majesty of nature, that make all the cycling – and all of life – worthwhile. 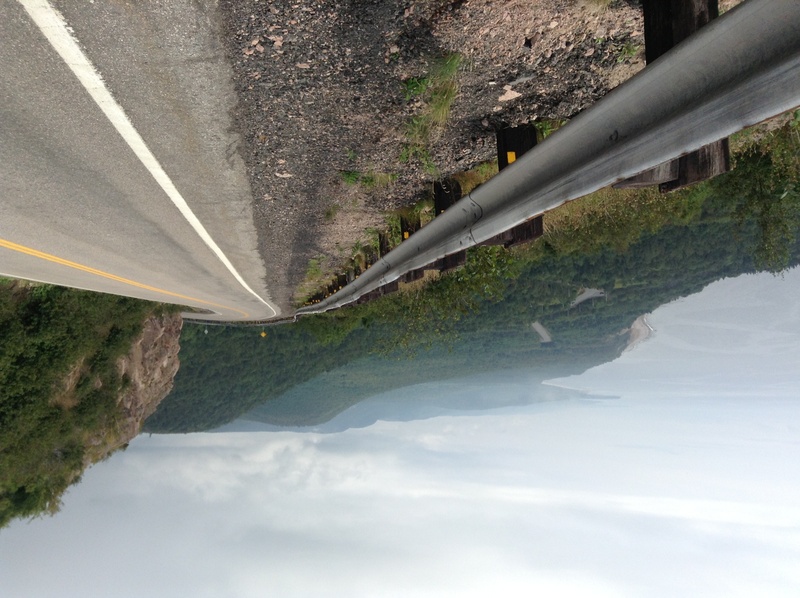 Cycling across Canada, Food, New Brunswick, PEI, why am I doing this? As a general rule of thumb, in Canada the cycling days have been glorious and the rest days have been spent wishing I was on the bike. My ride to Sainte Marie de Kent and subsequent rest day broke that rule, in the nicest way possible. The day’s cycling was fine but largely uneventful. There had been no threat of rain so I’d slept with the tent flaps open and thus had a bone dry condensation free tent to pack up in the morning. Monty and I set off along the main highway. The highway isn’t actually very exciting. 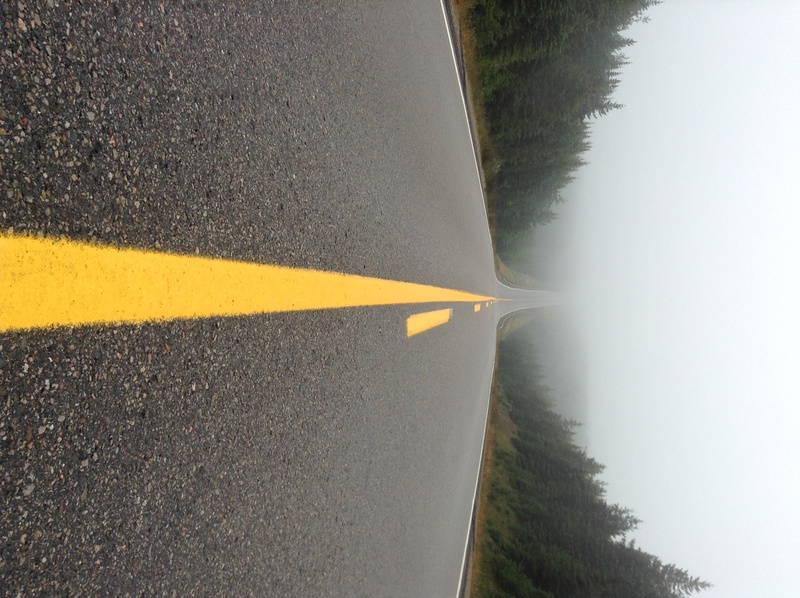 Is just a strip of grey Tarmac that bounces up and over the hills and through the forest. Every now and again I would pass through a small village decked out in Acadian flags. Some villages had painted the trunks of their electricity pylons in the Acadian colours. They really are quite patriotic. All around I could smell the piney, green fragrance of the forest. 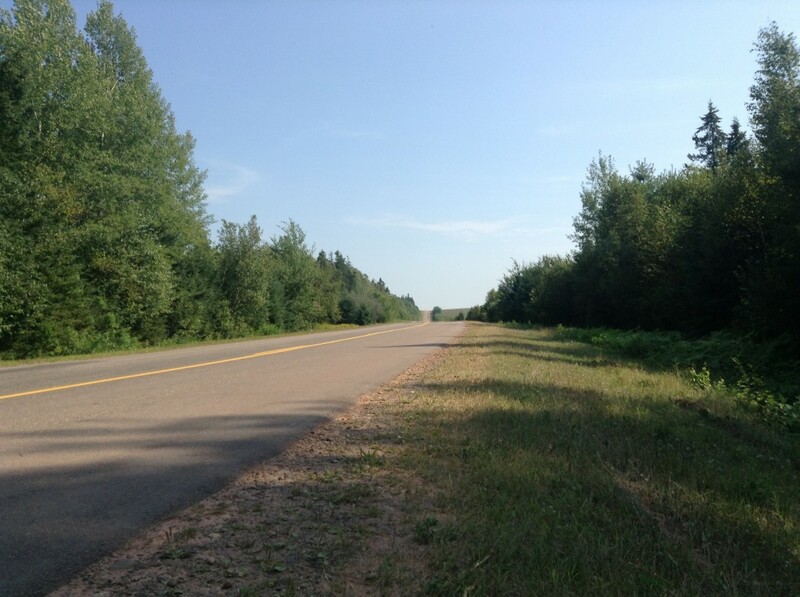 Soon enough I arrived in the town of Richibucto where the fragrance of the forest was interrupted by the strong scent of the sea. An aggressive line up of gulls watched over me while I ate my lunch by the small harbour. After a short snooze, ended by an extra loud screech from a gull, it was time to get pedalling again. My lodgings for the night came into view down a long, bumpy track cutting between a riot of wild bushes. I was essentially in the middle of glorious nowhere. At the end of the track, a large trailer stood in front of an old white house. 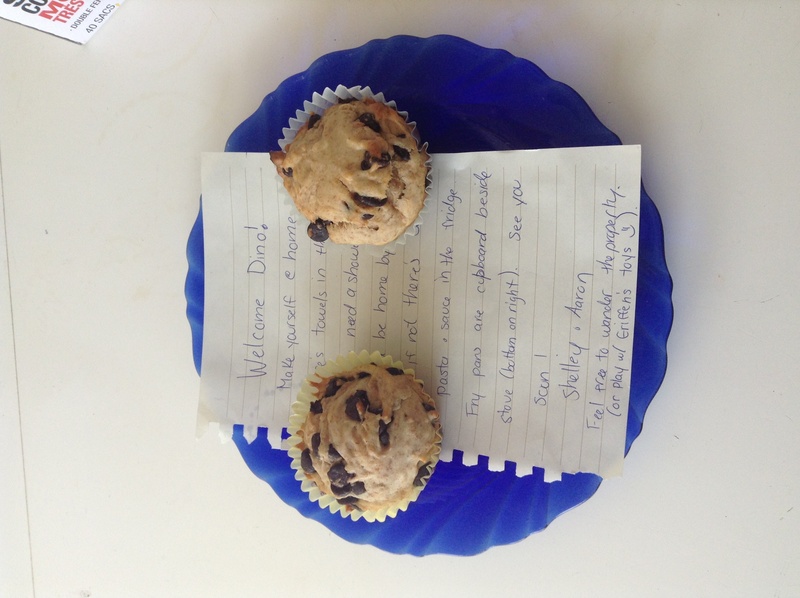 Aaron, Shelley and their young son were out at a farming conference when I arrived but I was greeted by a very cheery note and muffins. I wandered around the back of the house to where a line of washing was hanging up. There was a very large veg patch, stuffed with tangled towers of green beans, green tomatoes, neat lines of onions bursting through the soil, and a lively proliferation of leaves and squashes exploding out the patch. I went over to say hello to the chickens and the three goats (named Hans, Goat String and Tweedledum). 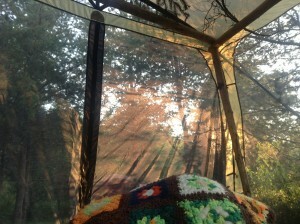 When Aaron and Shelley returned home they offered me the sofa, the tent or the mosquito net to sleep in. 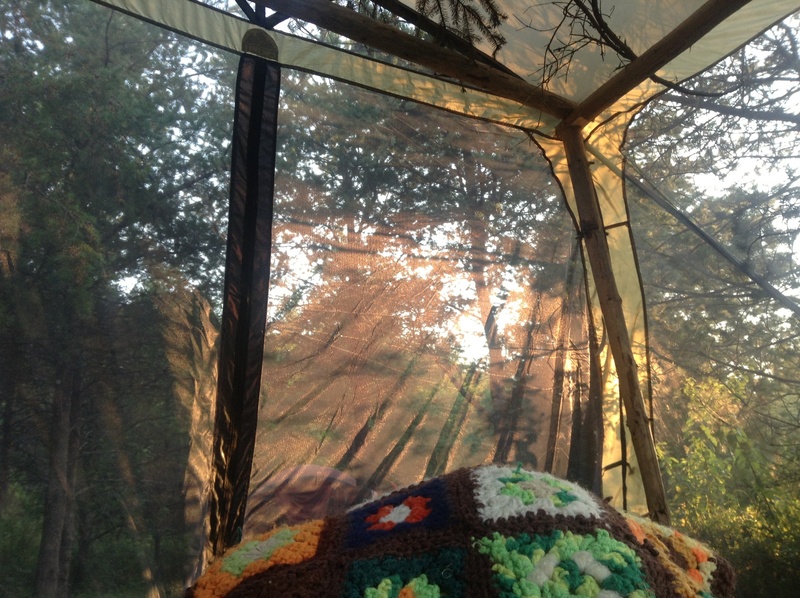 The night looked to be bright and clear so I opted for the mosquito net. As it fell dark I set about gathering kindling for the fire. A bright full moon cast bean-pole shaped shadows across the freshly mown grass. A chorus of insects buzzed in the background as the pop of the fire flung sparks into the sky. I chucked some grass on the fire to create some smoke to deter the bugs. It gave off a nice smell too. Aaron and Shelley came out the house and sat by the fire. We toasted some marshmallows. It grew late, though no darker thanks to the moon. When Aaron and Shelley retired to bed I snuck into my sleeping bag and fell asleep with the brilliant moon arching south west across the sky. The birds had stopped singing, the chickens had long since gone to roost, the goats bleated for a while but soon quietened down. Only the faint chorus of insects, their buzzing amplified by the silence, remained. I was woken up when the cockerel called. The sun hadn’t yet risen but the eastern sky was a palette of artist’s colours. 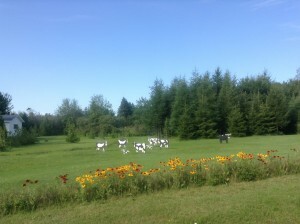 Wandering around, capturing the morning light on my camera I woke up the goats who jumped up on the fencing bleating. I worried they might escape again. My rest day was perfectly restful. In the morning we went blueberry picking and in the afternoon we went on a successful forage for chanterelles. After that I had a lazy nap under the mosquito net until it was time for dinner and therefore time to munch the chanterelles. In the evening I again fell asleep under the gaze of the moon. The only difference this evening was that the evening soundscape missed the bleating from the goats. Hans, Goat String and Tweedledum had, just before dinner, been picked up by the butcher. They will return in freezer bags. I couldn’t have wished for a better rest day and am very grateful to my kind hosts for having me stay.